She was the girl who used to get easily attached. But she has changed now. She used to fall headfirst into love. She used to be the woman with her heart on her sleeve, ready and willing to give it away to the first person who made her feel something, the first person who made her believe. When it came to relationships, she was never afraid to say ‘yes’ to someone of interest. While others around her were being cautious and careful, she was all too certain she’d found the one, and all too quick to give her heart away. She was always chasing the wrong guys, always falling for the men who couldn’t love her. Whether attraction or excitement, she found herself wrapped up, time and time again, with childish boys who thought relationships shouldn’t require any work. There were fights and raised voices, tear-stained pillows and hopes of a future shattered. She spun herself in circles trying to fix, to mend, and to blame herself even when she wasn’t in the wrong. Love hurt—and it wasn’t supposed to. Yet, she still thought it was beautiful. Heartbreak after heartbreak, she would still get up, brush herself off, and look for someone else. Even after pain she was all too ready to leave that behind to pursue what she thought was real. At least, that’s how she used to be. Now, her heart is beating to the rhythm of her own two feet. Now, she wakes up without thinking about anyone other than herself, without wondering about and wishing for a love that isn’t right. Where she used to obsess about whether or not she’d find ‘the one,’ now she’s smiling with hope of her future—a future that isn’t shaped by, or dependent upon someone else in it. In the past, love was her focus. She was always looking to have a strong connection with someone, even if that meant putting her own dreams or goals to the side. This wasn’t purposeful—it was often unconscious—but she somehow always found herself losing who she was in loving someone else. But now, she prioritizes her feelings above anyone else’s. 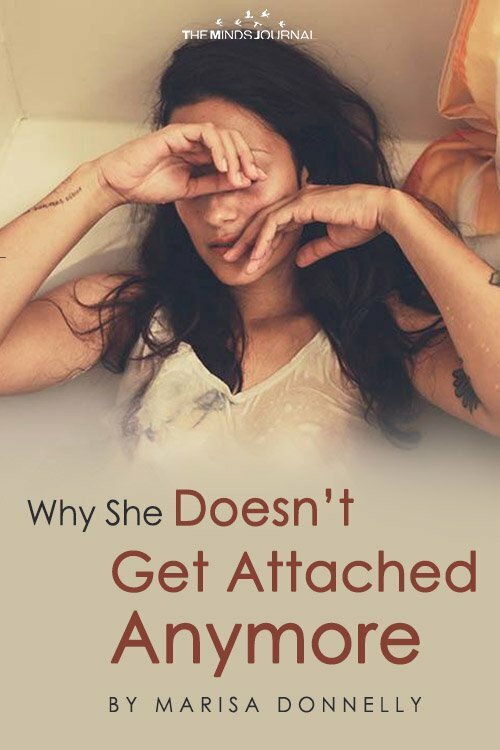 She listens and cares for others, but she doesn’t get attached anymore. There is too much ahead of her to get caught up in trying to be everything to someone who can’t love her back with the same intensity. She’s not angry or bitter; in fact, she’s the happiest she’s ever been. Instead of entangling herself in relationships with people who aren’t right, she’s choosing to pursue the best version of herself. She’s focused on her goals, on her career, on her platonic friendships trusting that when it’s meant to be, she will know. Her self-love journey has been a slow and difficult climb. Before, she was defining herself by her relationships, always seeing her identity in the arms of another person. Before, she was counting on the men in her life to boost her up, to give her the push she needed to finally look in the mirror with pride. After heartbreak and closed doors, she’s learned that true self-love is not found anywhere else but within. And instead of searching, she’s looking inward. She’s noticing how she feels, what she thinks, and what lights a fire inside her, and she’s beginning to pursue all those things. She’s not focused on relationships, not looking for anything serious or really anything casual, either. 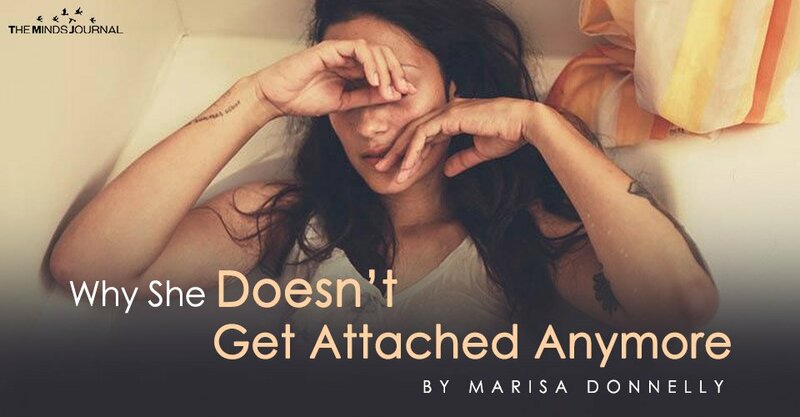 She doesn’t get attached anymore. Not because she’s purposely trying to pull away, but because she’s too busy loving herself before letting someone else in. In time, she knows that the right person will fall into place. She trusts that the universe will bring her someone to love when the time is right. These things can’t be forced, and she doesn’t want them to be. Love, to her, is a beautiful and messy thing. And she’s not going to search so desperately for it. When it comes to her, she’ll know. And she’ll welcome it with open arms.